What’s Wrong with this Stitch? I don’t know about you, but no matter how good of knitter you are, once in a while there will be a stitch that just doesn’t look right. In fact, it stands out like a sore thumb, but you can’t figure out what’s wrong with it. Case in point, is the knit stitch that leans to the left or right, ruining your lovely Stockinette stitch pattern. Below in the green box is an example of what I am talking about. You will notice that one stitch is leaning slightly toward the right, and is not in a straight vertical line with the others. When I first noticed this issue, I wasn’t quite sure what was going on, but alas, the light went on and, “bingo,” I had it. As I looked closer at the stitch I noticed that when I had knitted it, my needle had barely( and I mean barely) split the yarn of the stitch in the previous row. You would think that just a few hairs, or fibers couldn’t possibly have this much affect on the surface of a Stockinette pattern, but it does. It stands out for all the world to see. I my case, I was able to free the fibers with the point of my needle without having to take out several rows, but in most cases a re-do is in order. So if you see one of these “leaning stitches” in your work, you might consider the above cause, and check it out. One of the ways that I have learned to avoid this problem is to knit “steel to steel.” What’s that? When I put the point of my right needle into the stitch, I make sure that it comes in contact with the left needle, then I let the tip “ride” the surface of the left needle, under the belly and out the other side. By doing this I have almost eliminated the split yarn problem. The most beautiful knitted or crocheted work, is one in which the stitches are all the same size, and that goal is always before me whatever the project I am working on. I know that I am “knit-picky,” but that’s just the way I am. I even notice the uneven stitches in the photos in my knitting books, and wonder why they chose to use the picture. I guess some people just don’t notice it like I do. That said, I thought I would share a tip or two on adjusting the tension in loose stitches without pulling out your knitting. I am going to share this technique with four illustrations. 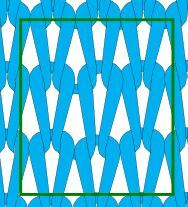 In the first one below, you will see the loose stitch in a green box. Counting down from the top row(the working row) you will see that the stitch was created in a “knit” row. 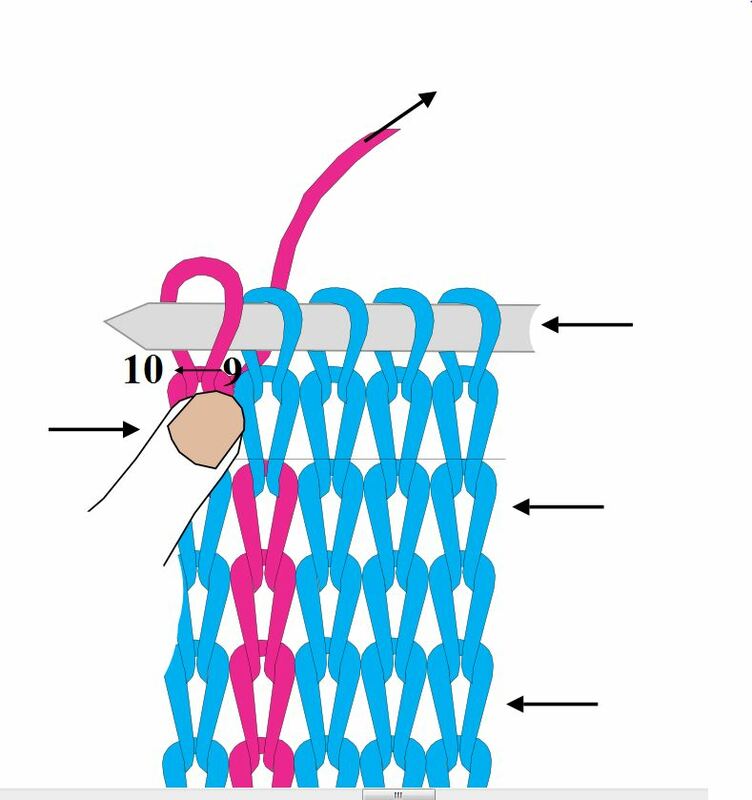 That means the right leg of the stitch must be lifted first (see #1). Once you have taken up the slack, lift the left leg (#2)of the same stitch, taking up the slack as before. 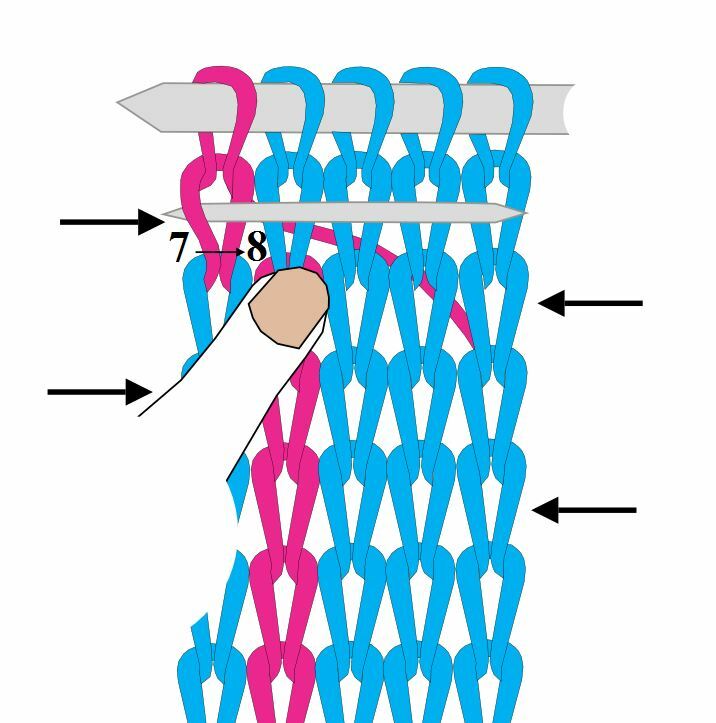 Now, place your thumb on the stitch to prevent the yarn from slipping back. 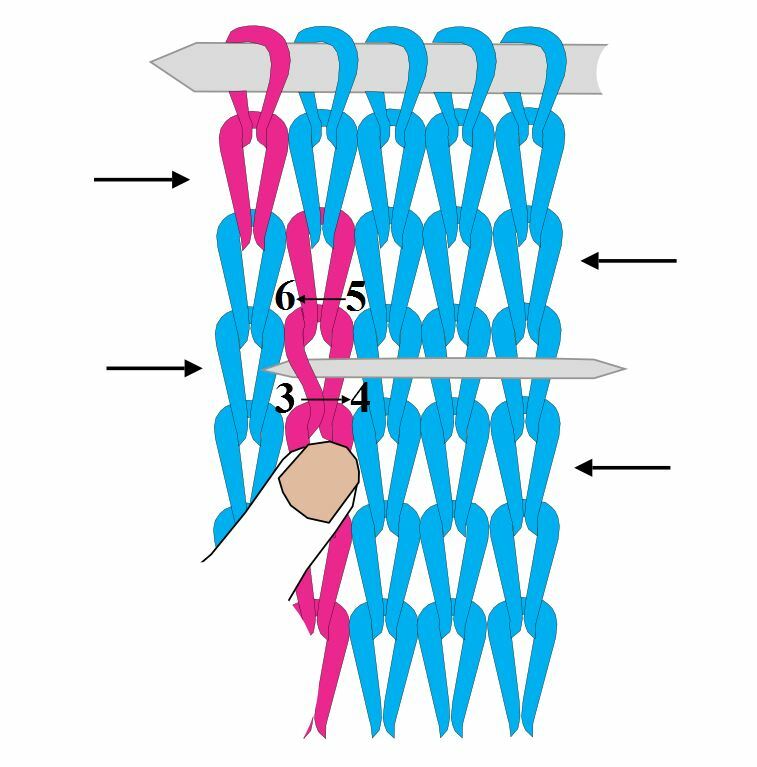 Next, you will move up to the purl row, and begin by lifting the left leg of the stitch (#3). Once you have taken the slack out of #3 and #4, move up to the row above and take the slack out of #5, beginning with the right leg. Take the slack out of 6, as indicated in the illustration. Don’t forget to place your thumb on the stitch when you are through adjusting it. In the third illustration, you will see that I have move up again. However, this stitch is off to the left. Does it matter?? NO!! The procedure is the same. 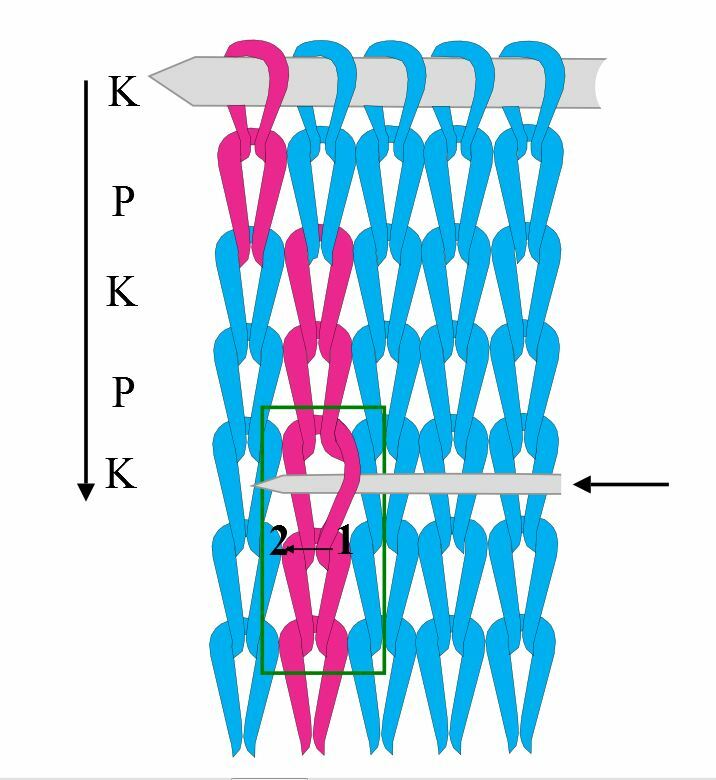 Because it is a purl row, you will begin by lifting the left leg of the stitch first(7). Next, lift #8, taking out the slack. Now that you have your slack yarn pulled up to the row you are working on, you can pull the rest of the extra yarn out by giving your working yarn a tug.